Tiger Woods and Phil Mickelson teamed together during a practice-round match Tuesday at Augusta National and walked away victorious over Fred Couples and Thomas Pieters. No participant offered a final score, or the stakes involved, but after going 2 up early, Couples reported that he and Pieters got “shillelaghed” by the two superstars. Oh, what Hal Sutton would have given that result in Oakland Hills. Couples said that Woods and Mickelson set up the Tuesday game. Couples wanted to play a practice round with Pieters, because he likes his game, and it just “worked out.” Woods told Couples during their nine-hole round Monday that they were playing with Mickelson on Tuesday – a rarity, to be sure, given their competitive friction over the past two decades. Starting on the back nine and playing in front of crowds that often were 10 deep around the tee box, Woods eagled both of the par 5s – a 15-footer on 13 and then a 4-footer on 15. Mickelson added five consecutive birdies on the back nine (Nos. 13-17). Boy if Phil can do that on the back 9 all week. WoW!! They said on TGC that Phil added an eagle of his own! Loved Phil's presser. Tiger's was good too. I loved that shirt and yes it was custom made!!! 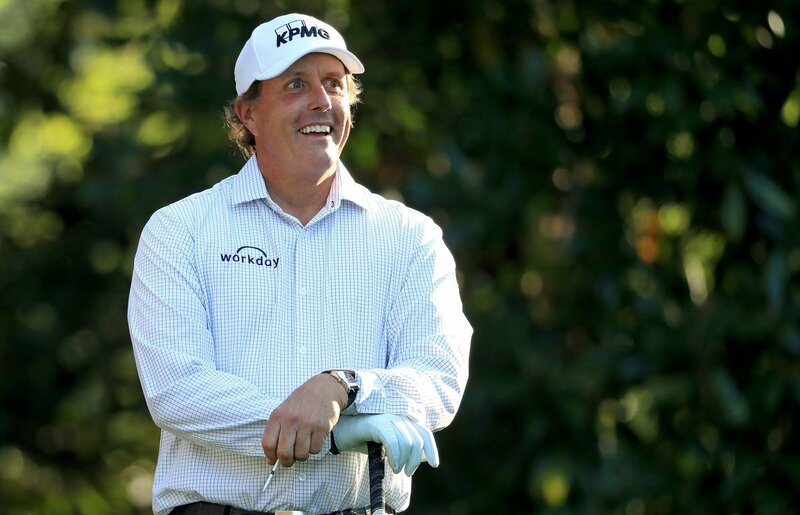 Yea, Phil already had "Workday" and his "jumping logo" on it, so if he wears it during the tournament, does Mizzing+Main come running with sponsor check in hand? Admin wrote: I loved that shirt and yes it was custom made!! !